From exhibitions to the first regattas of the season CYTV brings you exciting events that celebrate the world of traditional, vintage and classic yachting stories, arts and craft. Click the link below for our free 2018 classic boat regatta and event list. Good luck with your racing this season! 8th March 2018 - 7th January 2019. National Maritime Museum, Cornwall, UK. A fresh take on the TITANIC diaster. Learn how news of the diaster first broke, the National Maritime Museum explores the speculation and "fake news". With melancholia the curator has nodded at the commercialisation of the tragic event by displaying the first souvenir postcards. Objects on display feature a First-class passenger list found in the pocket of a victim. A Nazi propaganda film and the nearly long forgotten A NIGHT TO REMEMBER, the 1958 British drama film and adaptation of Walter Lord's 1955 book, are additions to this interesting new take the diaster involving a ocean liner regarded as 'unsinkable'. For classic boat builders there's a replica of LIFEBOAT 13 on display, constructed by the museum's in-house boat builders. More info here and video above. 11th April - 27th April 2018, Messum's Art Gallery 28 Cork Street – London, UK. Gallery blurb: "Once a shipwright, Dodds’ paintings illustrate the anatomy of boats, revealing the materials and curves that underwrite the finished vessel. Yet his paintings go beyond retracing the shipwright’s logic. Rich in colour, tone and texture, they move beyond the literal and evoke sailing’s mythic and historic dimensions." WOW! After just seeing the images of paintings due to show in April I'm yet again stunned at James' work year on year – different boats, slightly different colours – always a joy to see. It has been a few years since James exhibited a 30ft long triptych and from the catalogue there looks to be another on show. NOT TO BE MISSED. Find out more here. Feature your boat, company or service in 2018 and reach the sailing community online with inspiring stories and beautiful craftsmanship. Contact us here. 2nd May 2018, National Maritime Museum, London, UK. Are you worried about your highly valued art swinging around below decks? If so this is just for you. If you're not so worried about your art but more interested in marine art conservation, this may still be of interest! The National Maritime Museum is bringing specialists from yacht design firms like GL Watson (TALITHA G, BLUEBIRD, MALAHNE), John Leonida – Partner at law firm Clyde & Co and the museum's Helen Robertson together to talk about conservation of art at sea. 20th June 2018, National Maritime Museum, Cornwall, UK. Falmouth's great museum of the sea and all things maritime presents Britain on Film: Coast & Sea which original toured the country in 2015 – if you missed it then here's your chance to catch it while you can. The screening showcases the best of British seaside towns such as Weston-super-Mare, Skegness, Brighton. 1930's surfing in Newquay and scenes of tourist towns coping in war time Britain. Watch re-coloured footage shot by Claude Friese-Greene. Gauge how the RNLI produced early promo films, the private life of seabirds in Julian Huxley’s pioneering, Oscar-winning short film, a triumph of early environmentalism. The trailer alone brings a smile! Don't forget while you're there you could view the major exhibition 'Titanic Stories' in museum. Britain on Film Tour more info. Open until 30th September, 2018. National Maritime Museum / Het Scheepvaartmuseum, Amsterdam, Netherlands. Blaeu was the most successful producer of maps in the seventeenth century and this is an exhibition about his 'map of the world' dating from 1648 which has for a long time been hidden in museum archives. It is one of – if not, the Dutch National Maritime Museum's finest articles. The map's scale at 2 by 3 metres is impressive alone. Now open to the public, you have until 30th September to discover this important document. With the aid of magnifying glasses, Australia, or "Nova Hollendia" – as referred to by Blaeu in the mid 17th Century and New Zealand are visible. Both countries first appearance on a map of the world. Visit their site here. 1st July 2018, Les Sables d’Olonne, France. The well anticipated and inevitably dramatic Golden Globe Race will start in France in July. The event will commence in France's home for the famous single-handed offshore round-the-world sailing race the 'Vendeé Globe' in Les Sables d’Olonne. So far the race village will host a film festival celebrating pioneers of the sea, presentations from those most involved in previous and current off shore sailing like Sir Robin Knox-Johnston. As per the brilliant 'french way' of viewing such a venture you'll be able to watch the start first hand, at sea or from the harbour wall. During the race skippers have the ability to send short text updates every 6 hours, this co insides with GPS tracking so you can watch as events unfold at sea online. Unfortunately, the race organisers and competitors decided against boats competing with the ability to broadcast / transmit video but the GGR will delivering video updates on the progress of yachtsmen and women. In addition, the race organisers offer a chance for you to compete in a virtual race – this has proved very popular in modern off-shore events such as the Vendeé Globe. In contrast to the real competitors who are not allowed outside assistance as per the original event in 1968/69, spectators in the virtual race with the aid of wind/wave forecasts will have significant advantage and, interestingly an opportunity to compare navigation skills to those in the race. Click here to read more about the virtual race. What's the Golden Globe Race? 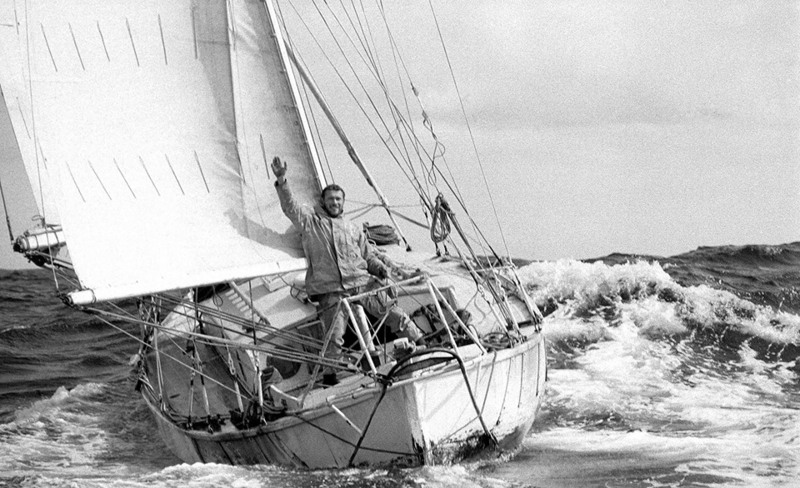 "30 sailors…30,000 miles non-stop…Alone…With no outside assistance", yes this is the 50th year since Sir Robin Knox-Johnston completed the first solo circumnavigation race in 1968-1969. 'The Sunday Times Golden Globe Race' has been revived to mark the anniversary. While you wait for the start in July, check out the Golden Globe Race website. Find out where to stay, where to eat and which yachts to charter here, in Classic Yacht TV's exclusive Destination Guide. Open until May 26, 2018. Maine Maritime Museum. Maine-built ships and mariners are celebrated and remembered in this exhibition that explore the state's resources contributed to defend in the Great War. Featuring naval and merchant ships, yachts, four-stackers and submarines. Perfect for the maritime historian or classic boat enthusiast. More info here. 1st January - 30th June 2018. Mystic, Connecticut, USA. Located in historic downtown Mystic, Spicer Mansion is a luxury boutique inn that offers guests the finest accommodations and dining experience. The once lavish summer Victorian home of Captain Elihu Spicer has been restored to its former elegance and now has select paintings from the Maritime Gallery at Mystic Seaport that adorn the walls of its salons, guest suites, and dining rooms. Image: David Monteiro, Stormy Seas, Oil 12 x 16. Read more here. 20 June - 20 September 2018. Australian National Maritime Museum, Sydney, Australia. "This exhibition showcases the stories of 19 unique women from the mid-1800s to present day all of whom have connections to the magnificent riverscape of the Murray Darling Basin home to Australia’s three longest rivers, the Murray, the Darling and the Murrumbidgee. From significant Aboriginal beginnings, paddle steamer trade routes, to a place, which has developed its own culture, the Murray Darling Basin is now a myriad of natural destinations like no other. The Women of the River Country exhibition was developed by the volunteers and staff of the Mannum Dock Museum in South Australia." Visit their site here. "At Zero hour", around 80% of the Port of Hamburg was in ruins. Around 3,000 shipwrecks in the harbor basin and in the river turned the Elbe into a huge ship graveyard. Today it is hard to imagine what this meant for the once proud port city. Some time after the unconditional surrender, the Hamburg photographer Heinrich Hamann (1883-1975) was commissioned by the British occupying forces to document the extent of the destruction in the Port of Hamburg. In the years 1945 - 1947 he set to work with his heavy plate camera.